In late September and the early weeks of October, Hurricane Matthew ravished the coasts of Haiti, Cuba, the Dominican Republic, and the southeastern United States. Lasting for days, the tropical storm became the deadliest Atlantic hurricane since 2005, responsible for more than 1,600 deaths. In the wake of the tragedy, Grace Brethren pastors in Florida met to strategize how they could lend a helping hand to those whose homes and resources were ravaged by the storm. “We discussed many options to specifically get help to Grace Brethren churches in the interior of Haiti, removed from Port a Prince and Cap Haitian,” explained Dr. Rich Schnieders, lead pastor of Friendship Grace Brethren Church in Ft. Myers, Fla., and chair of the Florida District Ministerium. The pastors discussed several options and decided on a course of action: working through the Haitien pastors from Florida and their counterparts in Haiti, as well as nonprofit Grace Brethren organizations Caribbean Vision Ministries and Breathe Partners, they would collect cases of water at their eight individual churches and have the cases transported to Haiti. This hands-on, boots-on-the-ground approach was very intentional. The response was overwhelming. 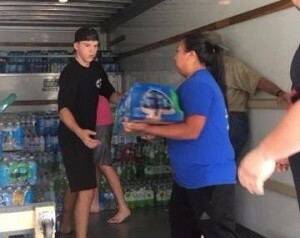 The drive, conducted at the end of November, brought in more than 50,000 bottles of water, destined for the eight Grace Brethren congregations in the Lascahobas area of Haiti – in the mountains close to the Dominican Republic. A crew of men from Friendship Grace Brethren Church collected the bottles and delivered them to Mispa Missionary Community Church in Miami, where the donations were prepared for shipment and distribution in Haiti. He is confident that the massive success of the project, and its hands-on approach, will translate into prayer and further involvement in ministry for Haiti. Send a note of encouragement to Pastor Schnieders by clicking here and Pastor Desir Nonhomme here. Feature photo: Grace Brethren Churches in Florida collected more than 50,000 bottles of water, destined for eight Grace Brethren Churches in Haiti affected by Hurricane Matthew.